On Sunday 15 March 2009, residents of the Reek Reay community, Group 46A, Village No. 8, claimed that workers for the Canadia Bank used force to demolish their homes, and the workers also fenced the residents, preventing them from leaving or coming into their homes if the residents refused to sell their lands to the Borey Bassac Park Villa company. Bun That, a young man who resides in Village No. 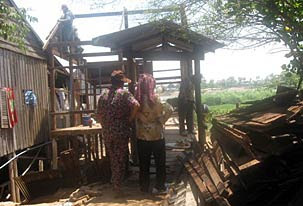 8, Group 46A in the Reek Reay community, indicated that the bank set a price limit for each plot of land and the home on it to: either (1) $20,000 (in compensation) or (2) a row house measuring 4-meter-by-10-meter located in Dangkao distritct plus $10,000 if the residents agree to leave. If the residents refuse to leave, they will use force to demolish their houses, and they will fence in the residents’ houses to prevent them from leaving or coming into their houses. As of today, the bank’s workers have used force to demolish 9 homes already. Hor Vannak, chief of Village No. 8, Group 46A, Reek Reay community, said that in his village, there are more than 200 families living in more than 200 houses. Most of them are civil servants. He said that the village is connected to the road and the park of the Koh Pech development zone. Later on, the residents received offers to sell their lands and homes by the Canadia Bank and by a number of private groups. Phal Sithon, the Tonle Bassac deputy commune chief, said that according the directive no. 157, dated 30 January 2009, issued by the Council of Ministers, decided that there will either be a development of the Reek Reay community at the same spot or the residents will receive another house measuring 4-meter-by-10-meter in the suburb as compensation plus $10,000 in cash. Regarding this issue, RFA could not reach a representative of the Canadia Bank on Sunday to obtain clarifications on this issue.